Voter Suppression,Vote Buying, Vote Stuffing become far easier in this system. In a system which provides ballots to every registered voter, but routinely turns out less than 100% of those registered, there’s a lot of extra ballots floating around in the system. People who don’t vote often may be tempted to sell their vote, or even give away their ballot. This is because all that is needed to sell a blank ballot is a signature. As we’ve seen in recent years, even national elections can hinge on the thinnest of margins. Close races will drive up the value of each and every signed ballot. The main tool that prevents this type of vote selling is, in fact, the secret ballot booth. Fraud and coercion will not be prevented with a “privacy envelop,” commonly used in vote by mail schemes. Accidental double voting can and does happen. Some people are forgetful, and vote early when the ballot arrives 3 weeks or so before an election. But then when election day arrives they can’t remember if they’ve voted, so they request a new ballot, or go to their polling place. While systems are in place to try an prevent double voting, the reality is that these systems are not perfect, and sometimes that second vote will be both cast and counted. In fact, it is not unheard of that for voters to receive duplicate absentee ballots in the mail due to clerical errors, etc. This also increases the potential for accidental double voting in the system. Some studies show a short term spike, but long term decline in voter participation, in 100% absentee systems. Claims that Vote-By Mail will increase turnout have no real evidence supporting this assertion. After running the No Vote By Mail Project for going on 2 years now, a pattern seems to be emerging that small jurisdictions (really small), and elections that have typically low expected turn-out, like the proverbial dog catcher election, can see the greatest potential increase in turn-out with VBM. However, large elections are seeing some signs of decreased participation after switching to 100% VBM systems. Current hypothesis include the increased likelihood that voters start treating ballots like “junk-mail,” and the undermined nature of “voting day” as a special day of civic engagement. The post office loses mail or just misplaces it for years, the county loses ballots, and people lose their own ballots. The post office does not release delivery statistics. They have in fact conducted internal audits, and the GAO has conducted audits as well. Currently though it is impossible to get these numbers. Even with a 99% delivery rate, 1% of the ballots would be lost in the mail. Judging by the amount of mail I get everyday for people that no longer, or never, lived in my house, it is easy to assume that the accurate delivery rate for elections is not 100%. And it’s not just eventual delivery rates that matter anyway, it’s on-time delivery. Because elections are time sensitive accurate statistics as to on-time delivery rates are important for calculating any margin of error rate for a 100%, or partial, Vote-By Mail system. The Absentee System greatly alters the Precinct System. If voting at your local precinct polling place is replaced by voting through the United States Post Office, not only will society at large lose a well developed civic infrastructure, but it will inevitably alter that system. What the exact nature of this impact is unclear. And I have not had enough time, or grant money, to properly research this question. 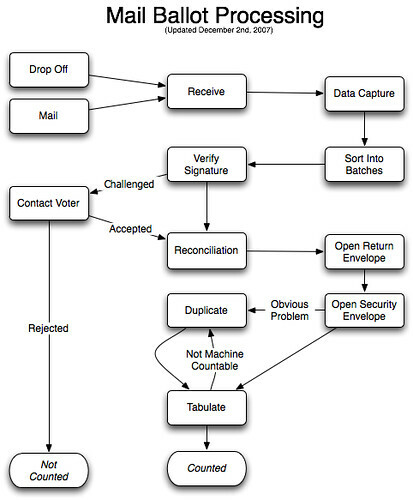 Vote-By Mail systems vastly increase the time it takes to count elections. Far from increasing the speed of elections, Vote-By Mail makes counting elections take a lot longer. Why? Because votes are still coming in prior to the official election day. In most systems, like Washington State, the ballot only needs to be postmarked, not delivered by election day. Therefore ballots are continuously added to the vote totals until the official date of certification, 2 to 3 weeks after election day.Oregon has a requirement that the ballot be delivered by election day. However, this is only marginally better, as ballots that are postmarked in time may be delivered late, well after election day. Any day that is chosen will see a certain percentage of ballots disenfranchised due not to lost mail, but rather to delayed delivery. Vote-By Mail systems eliminate “Election Day” and replace it with “Election Month,” thereby greatly increasing the costs campaigns must spend on GOTV (Get-Out the Vote) efforts. The cost of competing in a Vote-By Mail system, as a candidate, is increased due to GOTV efforts taking 1 month, rather than the the weekend before the Tuesday vote. So 3 day GOTV efforts are affectively replaced with a 30 day GOTV effort.As costs increase, only established and well-funded campaigns can maintain GOTV efforts for weeks on end. Smaller campaigns without deep pockets will find it even harder to compete in Vote-By Mail systems. Election Month greatly changes the “timing” of the campaign calendar, but organizations that interact with the political calendar have been slow to react to this phenomenon here in Washington State. Traditional low-cost mass media methods of reaching voters can be somewhat negated as not all the free mass media type of information has has time to reach the voters.Looking at the 2008 Presidential Primary Race, many California voters cast early absentee ballots before the California Televised primary debate was aired. Many voters’ only access to less well known candidates has been from televised debates. Jesse Ventura went into the televised debate for Minnesota’s Governor at 10% polls, and did so well in the debates that he was subsequently elected Governor. In a Vote-by Mail system, later arriving information will have less impact on races, and novices will need to figure out new ways to compete against well funded big name campaigns.This type of time shift is also occurring at the local level here in Washington State, a predominantly Vote-By Mail state. News cycles must start earlier, and local precinct level candidates forums are not used to the time shift, so often candidate forums are taking place too late for candidates to make their case for running for office directly to the people. This drives up the cost of mass media spending, and makes it harder for new candidates without established donors to compete.Vote-By Mail systems alter the time-table of the election cycle. The change to Vote-By Mail means many voters will vote before all the information has been presented by candidates, civic institutions are forced then to either adjust their calendars, or as is currently the case, they don’t change there forum dates, rather fewer voters have a chance to see candidates in person at these forums. In a Presidential Primary, some voters will cast their ballots for candidates who have dropped out by the time the votes are counted in that state. In the Presidential Primaries Candidates may drop out of a race before votes cast votes are counted in states behind Iowa. For instance, in 2008, California started voting a month before the official February 5th, voting day, so those early votes were cast up to 30 days before the counting begain. In this time, John Edwards voters were effectively voted early for a candidate who was not on the ballot when the California race was counted. California’s Presidential primaries in 2008 are a good example of this. Well funded campaigns like Hillary Clinton and Barack Obama started blanketing the state with advertising weeks before the absentee ballots were mailed. However, the Televised debates weren’t aired until half-way through the month, therefore many voters had voted prior to the debates, and also prior to several candidates withdrawing from the race.In NJ, half of the candidates on the Democratic primary ballot had dropped out before election day, and a judge ruled that those absentee voters who had already voted for a candidate who was no longer in the race were entitled to vote again in the primary. Many, many people have gone to jail already for rigging elections using absentees, throughout the country and around the world. This is occurring in the here and now, not some distant past. These are not “isolated incidents.” Mayors, County Auditors, and County-wide co-conspirators are the phrases I’ve come across in the last two years. The rate of voter spoiled ballots is hire, much higher, than poll place voting, because voting machines like the paper based optical scan system can reject spoiled ballots letting the voter know that they misvoted…. 2nd chance voting is then possible. Not so in VBM systems. The only number we really have each election cycle is the number of ballots received from registered voters. Other numbers are either not being tracked, or, as in the case of USPS delivery rates are confidential, not allowed for public consumption. In Oregon 2.5% of voters report intimidation in the VBM system there, and 0.5% report changing their votes in accordance with that intimidation.